The holiday season is quite over and Summers are just around the corner, although the corner is a little away still. Apart from the gifts, and vacations, great sales, the holiday season now also results in people taking a bucket load of photos. It’s the season many users will get the storage full warning on their phones. We have something that can help you backup your holiday photos from your smartphone though and it’s called AnyTrans. Let’s see how we can backup smartphone photos to the computer or a cloud drive easily. With so many different devices these days, managing files between them can be a real hassle. One of the prime examples of this is managing your music files. You need to copy the same file to all your devices so you can enjoy listening to your music on any device. That’s one of the many reasons music streaming services have taken off so well. While they do solve this fundamental problem, they don’t account for other non-music files. AnyTrans is a file transfer utility that can help, but it’s also more than just a file transfer utility. 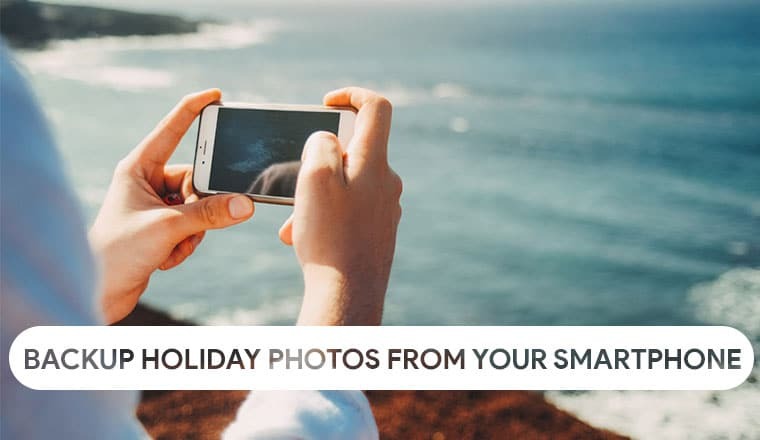 It can do a lot more apart from letting you backup your holiday photos from your smartphone. 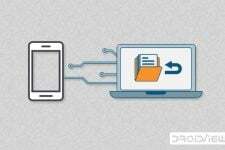 Generally, Android and Windows devices will play ball with any other device you connect them to in order to transfer files. With iOS though, file transfer takes on a whole different meaning. iOS doesn’t have a proper file management system itself. Therefore, unless you have iTunes or similar software installed on your PC, files can’t be transferred to or from an iOS device. AnyTrans is that piece of software and it works nicely even with iOS. Some photos are meant for showing to all but some of them may be private, you can hide your photos and videos on Android in a private vault with PhotoVault. You can download the installer file from the official AnyTrans website linked below. It has the installer files for both Windows and macOS. Once you download the appropriate installer for your system, run it and you’ll see the options to install the iPhone & iPad Manager, Cloud Drives Manager and the Android Device manager. Since the app does a lot more than just file transfer, it’s neat that it gives you the option to choose only the features you want to install. 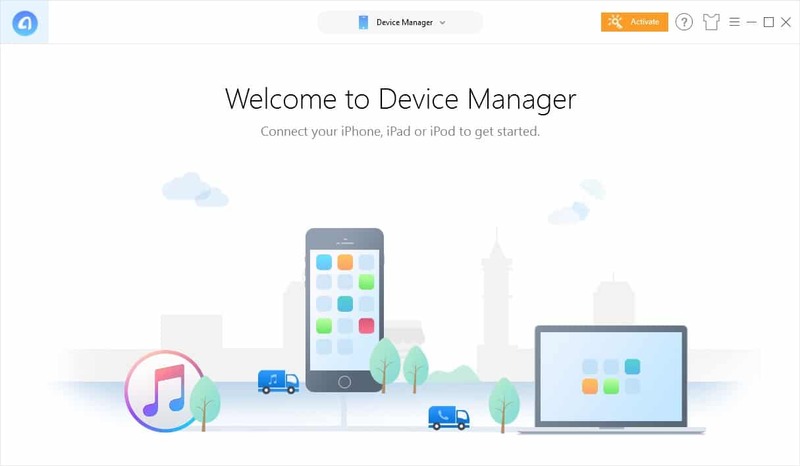 The iPhone & iPad Manager is a competent alternative to iTunes for managing your iOS devices. When you first launch it, you should see a similar screen as shown above. 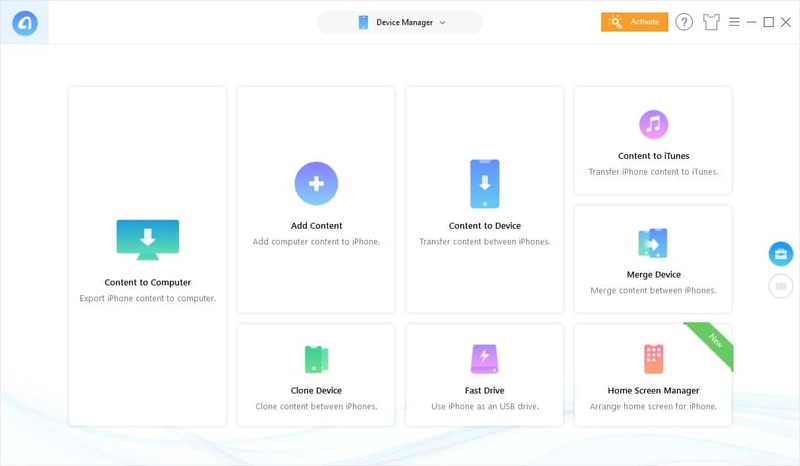 As soon as you connect your iPhone or iPad, AnyTrans detects it and shows you all the things you can do with it as shown below. 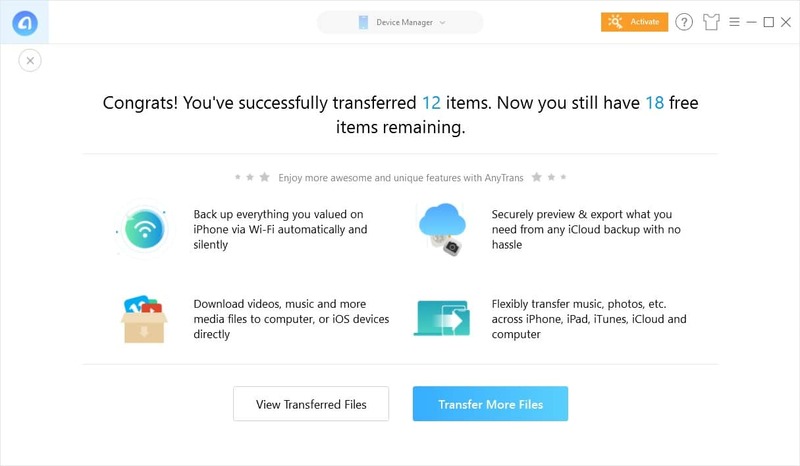 It allows you to transfer files, photos, videos, etc. from your iOS device to your PC and vice versa, or transfer the content between different iOS devices directly, merge the content, clone it, as well as upload it to iTunes. We’re already past the territory of functions the official iTunes can perform and the best one is still left out. AnyTrans also lets you use your iOS device as a USB storage in case you need to. That’s one gripe I’ve had with iOS for a long time, solved so easily. You can also easily arrange your iPhone’s home screen using your computer’s mouse to easily drag and drop icons or let AnyTrans create folders automatically and arrange apps in your preferred order. 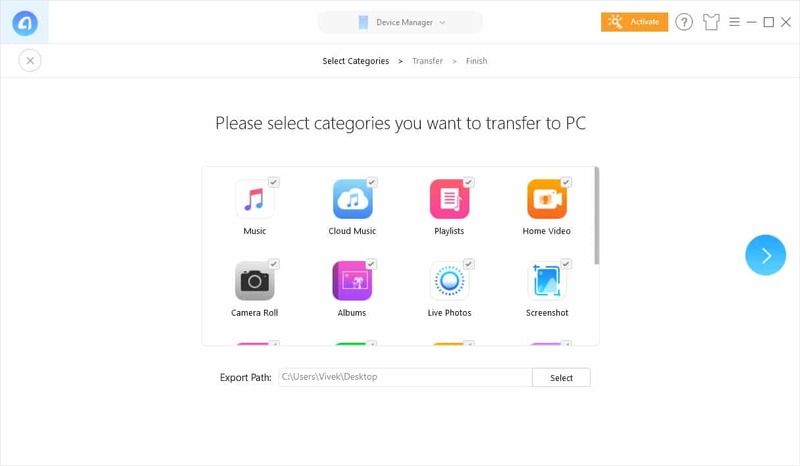 From the main page of the iPhone & iPad Manager, select Content to Computer. 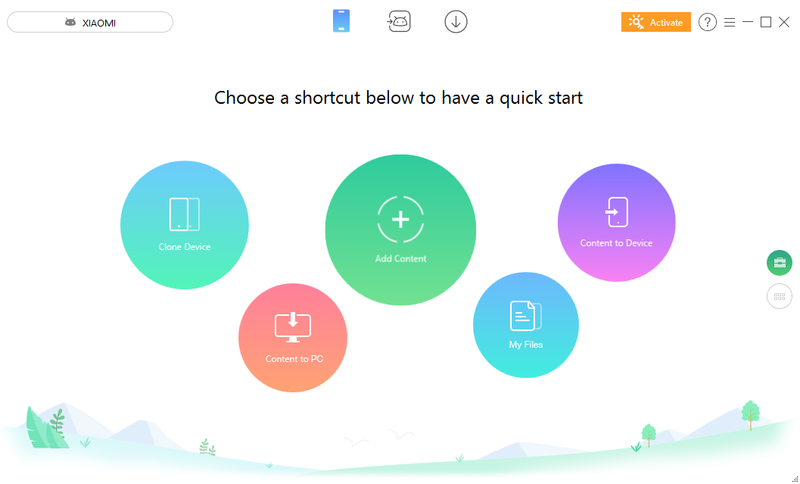 On the next page, you’ll have the option to choose what you want to back up. By default, everything is selected which is actually better. But if you only want to back up your photos, uncheck everything other than Camera Roll, Albums, Live Photos, Screenshots, and Photo Selfies. On the bottom, you can select a location on your PC where the photos and other things will be copied to. When you’re ready, click on the blue, forward arrow button on the right. The tool with then copy all the selected files to the selected location inside a newly created folder named so that it can be easily recognized. When the backup is complete, it will tell you how many files were backed up. This is not all though because all of this is included in the Device Manager section. You can access a whole lot of other functions by clicking on the drop-down menu at the top. Device Manager is selected by default which is why you see the device management features at the front. You can manage your iCloud drive, backup your iOS device over WiFi using AirDrop, sync iTunes data to your PC or iOS device, and even transfer data between Android and iOS. Android devices don’t exactly need a third-party, or any app to manage files. The OS itself has a robust file system and it can also be used as a USB storage. Files can also be just as easily transferred between a PC and an Android device. However, AnyTrans Android Device Manager makes the experience smoother and simpler. 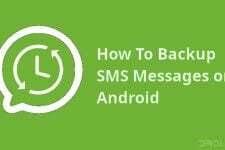 For instance, transferring data between two Android devices can be cumbersome. With this nifty tool though, it is a one-step process after you’ve connected both the Android devices to your PC. We have covered the features of the Android Device Manager in detail and you can read about them by following the link below. 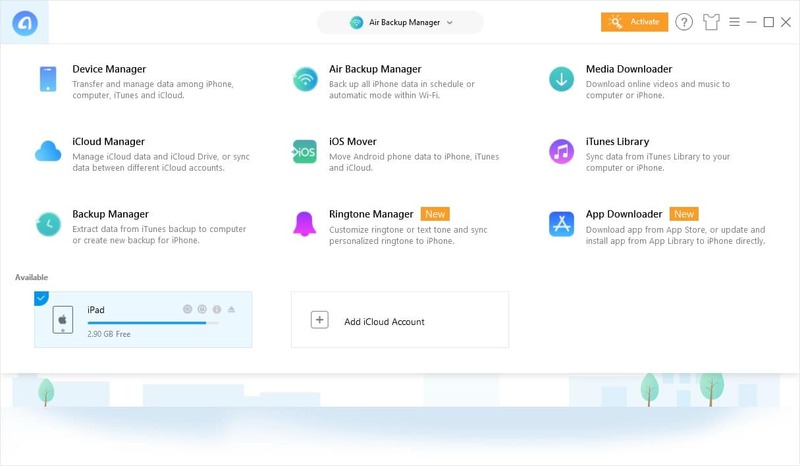 If you use more than just iCloud storage on your iOS devices, or even if you don’t use iCloud at all, AnyTrans Cloud Drives Manager can make your life simpler if you do use multiple cloud drive services. One can manage Google Drive, OneDrive, iCloud, Dropbox, Box, and pCloud storage services all from this single app. It even supports multiple accounts of the same cloud storage service. We’ve discussed this in detail before so we’ll just drop a link to that article below.